Why Pandavas Could not Save Abhimanyu in the Mahabharata War? Abhimanyu, the son of Arjuna and Subhadra, was killed on the 13th day of the Kurukshetra war in the Mahabharata. Subhadra repeatedly asks Krishna and Pandavas - “How can Abhimanyu be killed when Pandavas and Krishna are present in the same battlefield?” Why Pandavas could not save Abhimanyu? On the 13th day of the battle, Drona, the commander of Kauravas, constructed Chakra Vyuha – a circular type of battle combination. Only Krishna, Arjuna and Abhimanyu knew how to break the Vyuha. Kauravas had made a detailed plan. They knew that Chakra Vyuha would be easily broken by Arjuna. So they asked Samshaptakas to keep Arjuna busy. Samshaptakas (Trigartas) are warriors who had taken an oath to die or kill Arjuna. Arjuna and Krishna was busy fighting them the whole day and was on another part of the Kurukshetra. Now only Abhimanyu knew how to break the Chakra Vyuha. 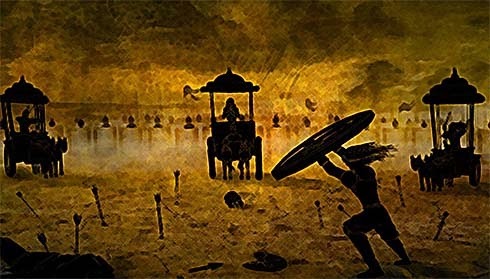 Yudhishitra asked Abhimanyu to penetrate the Vyuha so that other warriors in the Pandava side can follow him. But the four Pandava brothers and other warriors were stopped by Jayadratha. King of Sindhu, Jayadratha, had got the boon from Shiva that he will be able to counter Pandavas except for Arjuna. During the exile period, Draupadi the wife of Pandavas was abducted by Jayadratha. But Pandavas led by Bhimasena defeated Jayadratha and humiliated him. To avenge the dishonor, he performed intense austerities to please Shiva. Mahabharata states that Jayadratha withdrew his sensual organs from all objects of pleasure. He bore hunger, thirst and heat and kept on chanting ‘Om Namah Shivaya’ in dense forest. He became so thin that he seemed to be made out of veins. Shiva finally gave him darshan. As boon, he asked the power to counter Pandavas in battle. Shiva gave the boon that he will be able to withstand the four pandava brothers except Arjuna. All this factors were responsible for Abhimanyu getting killed in spite of the presence of Pandavas and Krishna in the battle field. Story – Why Abhimanyu was killed at the age of 16?